Amid the radical upheavals of the early 1900s, the Austro-Marxists tried to marry revolutionary aims with reform-minded practice. On May 1, 1893, tens of thousands of people marched through the streets of Vienna to mark International Workers’ Day. Proclaimed in 1889 by the newly formed Socialist International, the annual May Day demonstrations reminded the world of the labor movement’s growing strength and raised social, economic, and political demands ranging from the eight-hour day to universal suffrage. In Vienna, the Austrian Social Democratic Workers’ Party (SDAP) took up the call and rallied in the capital. Three Viennese students — Karl Renner (aged twenty-three), Rudolf Hilferding (sixteen), and Max Adler (twenty), all members of a local socialist student group — enthusiastically joined their ranks. Thrilled to be part of a mass movement that aimed to transform the world, they were not deterred when the police, after hearing calls for a “red republic,” broke up the rally, arrested participants, and put them under surveillance. The three young men continued to meet to discuss the ideas of Immanuel Kant, Karl Marx, and others. In 1895, the trio set up a group called The Free Association of Socialist Students and Academics. Although it had no official connection to the party, SDAP leaders, such as party founder Victor Adler, promoted its formation, and for the next thirty years it would serve as a pipeline into the party’s leadership. In 1899 Hilferding succeeded Adler as chair, and a year later Otto Bauer joined the group. The four men soon emerged as the chief proponents of Austro-Marxism, a school of socialist politics that tried to marry revolutionary aims to reform-minded practice. Owing to their role in one of Europe’s largest socialist parties — and Hilferding’s leadership in the preeminent socialist party, the German SPD — the Austro-Marxists would carry their distinct message far beyond the borders of the Austro-Hungarian Empire. Socialism was on the rise in turn-of-the-century Austria. Like the Socialist International, the SDAP had recently emerged as a united organization after decades of government repression and internal division between groups of “radicals” and “moderates.” Under Victor Adler’s leadership, the factions came together at the Hainfeld Congress of 1889, where they passed a program whose basic principles, with some adjustments, guided the party’s outlook and political practice for the next three decades. The Hainfeld Program consisted of two main parts. The first laid out a set of basic theoretical principles. The fundamental cause of inequality, it asserted, was not faulty political institutions, but rather the private ownership of the means of production. It was the role of organized workers to overturn this relationship, which “stunted intellectual growth” and produced “mass poverty and growing misery for ever growing strata of the population.” And it was the role of the party — which was prepared to use all “practical and legally acceptable means” — to aid their historic mission. The Program’s second part — after asserting the SDAP’s internationalism and condemning the privileges of nations, of birth, and of gender — enumerated a host of concrete demands: labor legislation, free public education, the eight-hour day, progressive income taxes, trade union rights, separation of church and state, the replacement of the standing army with a popular militia, and the introduction of universal, direct, equal, and secret suffrage. For the Social Democrats, the franchise was decisive. They viewed class struggle as the lever of economic transformation, but argued that it could be fought with less violence and fewer victims if the ruling classes were prepared to concede basic democratic rights, such as participation in elections and in governance, to workers. Revolution, they argued, could not simply be decreed. It could arise only as a result of mass unrest in the context of a severe economic or political crisis. Social Democracy’s task was “not to organize the revolution, but to organize for the revolution; not to make the revolution, but to use it.” That meant educating workers and building the movement through electoral struggle, trade unions, and reforms that demonstrated the power of worker solidarity. What the Austro-Marxists were proposing was a distinctly “centrist” course. They rejected the “evolutionary socialism” of Eduard Bernstein and his calls for socialists to ally with liberals in parliament. At the same time, they resisted the demands by Rosa Luxemburg for mass political action, worried that such tactics could prematurely trigger a life-and-death struggle with the state. They argued, instead, for using the existing institutional and legal tools (parliament, unions, the press) to patiently build the movement until it overwhelmed the powers of the ruling class. Only if ruling elites attempted to roll back social or political reforms should the movement support revolutionary action, such as a political mass strike. The Austro-Marxists’ fidelity to legal means didn’t impress their ruling class opponents. The Austro-Hungarian Empire was a semi-absolutist regime that, until 1897, denied the franchise to workers, allotted minimal powers to representative bodies to which only the propertied had access, and concentrated decisive power in the executive branch. Reactionary Catholicism dominated the state and society, civil liberties were not guaranteed, and the labor movement faced ongoing repression. The SDAP had made the case for a different, more democratic society. Getting there would be much more difficult. Hilferding, Adler, Renner, and Bauer all threw themselves into the party’s efforts with enormous energy. Seeing intellectuals as revolutionary pedagogues, they created “Zukunft” (Future), a school for Viennese workers, in 1903. A year later, they founded a journal, Marx-Studien (Marx Studies), edited by Hilferding and Max Adler, and dedicated to engaging Marxist critics in a wide range of disciplines. As students of Carl Grünberg, one of Europe’s few “professorial Marxists,” they conceived of Marxism “as a social science, which should be developed in a rigorous and systematic way through historical and sociological studies.” Within a few years, all of them had established their intellectual credentials, publishing widely respected works on political economy (Hilferding), the nationalities question (Bauer), law (Renner), and philosophy (Adler). While Max Adler practiced law and concentrated mainly on writing, his three comrades moved quickly into movement positions. In 1907, the year male workers finally achieved full suffrage, Bauer became secretary of the SDAP’s much-enlarged parliamentary delegation, a key post that brought him in contact with the party leadership. He also wrote for and edited the party’s flagship daily, Die Arbeiterzeitung (The Workers’ Paper) and co-edited, with Renner and Adolf Braun, the theoretical journal, Der Kampf (The Struggle). While Renner became one of the SDAP’s foremost parliamentarians, Hilferding moved to Germany, where he taught at the Party School in Berlin, became a leading editor of the SPD’s most important paper, Vorwärts (Forward), and contributed regularly to European Social Democracy’s most widely read theoretical journal, Die Neue Zeit (The New Age). These positions in the party and press gave the Austro-Marxists significant clout in debates on all aspects of party theory and practice. They reached not only the intellectual and political leaders of the movement, but also the broader public. The Austro-Marxists’ attempt to steer Social Democracy down a centrist political course had mixed results. While the party and unions continued to grow, Social Democratic hopes for substantial reforms met with little success as nationalist divisions rendered parliament impotent and, after 1910, fractured the party and unions along regional lines. Worse yet, the outbreak of war in 1914 threw the Austro-Marxists themselves into disarray. Hilferding immediately opposed the German party leadership’s decision to support the war as a betrayal of socialist internationalism. He left the SPD in 1917 and became a leader of the newly founded anti-war Independent German Social Democratic Party (USPD). Bauer and Renner, on the other hand, supported the war as a defensive struggle against reactionary tsardom. Bauer was captured on the Galician Front and spent three years as a prisoner in Siberia. Too old to serve, Renner became a leading apologist for the Austrian war effort, and he and Hilferding often crossed swords in the socialist press. Outside events, however, would soon return the Austro-Marxists to the same political path. In 1910, in his great work of political economy, Finance Capital, Hilferding had written that capitalist imperialism would likely spark a war that would unleash “revolutionary storms.” And that’s exactly what happened. The Russian revolutions of February and October 1917 swept away tsardom and created the first workers government in modern history. A year later the German and Austro-Hungarian monarchies collapsed in the face of popular revolution. By 1919 Germany emerged as a progressive, though still capitalist, republic headed by a Social Democratic government. Austria-Hungary had fragmented along ethnic lines, but an independent Austrian Republic arose under Socialist leadership with Karl Renner as chancellor and Otto Bauer as foreign minister. During the tumultuous years of postwar revolution and counterrevolution, the Austro-Marxists all held firm to the belief that socialism could best be realized within the framework of a parliamentary republic. They supported the socialization of key industries, the introduction of economic planning, the expansion of the welfare state, and the creation of new institutions of workers’ representation, such as factory councils. Simultaneously, they rejected the Bolshevik model of “proletarian dictatorship” based on workers’ councils, arguing that stripping non-proletarians of political rights was a recipe for civil war. Appalled at the Bolsheviks’ use of terror during the Russian Civil War and the construction of a police state, they argued that socialism could not be built in a country in which workers were a minority and democracy did not exist. Finally, they rejected Bolshevik efforts to split the global labor movement along “reformist socialist” and “revolutionary communist” lines. They viewed the newly founded Communist International as an instrument of Bolshevik control rather than an institution to reunite the international labor movement. The Austro-Marxists hoped to show the rest of the socialist movement that there was a better route, through mass education, organizing, and parliamentary methods. In Germany, where the movement was divided into hostile Social Democratic and Communist parties, Hilferding returned to the SPD and helped it become the largest party in parliament. He supported the SPD’s entrance into coalition governments with moderate, non-socialist parties as a means of promoting pro-labor reforms. Bauer took a different tack in Austria, where he became the de facto party leader and skillfully adopted a radical posture that avoided a party split. Unlike Hilferding and Renner, he opposed participating in a national government until the Socialists had an absolute majority. By 1928, in a country of 6 million people, the Socialists could boast 600,00 members and a 40 percent share of the national vote. True, they remained in the opposition and had had to cede power to the conservative Christian Social party. But the labor movement, by all estimates, seemed to be vibrant and growing. And “Red Vienna” — their crown jewel — was still standing. Red Vienna was the Austro-Marxists’ reform-revolution hybrid made manifest. Commanding absolute electoral majorities in the capital city, the SDAP used its control over local government to improve the lives of average people and build mass support. The years immediately following the 1918 revolution had been hard for most Austrians. Accelerating inflation, mass unemployment, food shortages, and a lack of urban housing plagued the country, and workers’ lives remained difficult even after the situation eased in the mid-twenties. Vienna’s government responded to the crisis with a massive investment program — paid for by progressive taxes on luxury goods and services as well as on private property — to improve urban infrastructure, provide employment, and construct public housing. 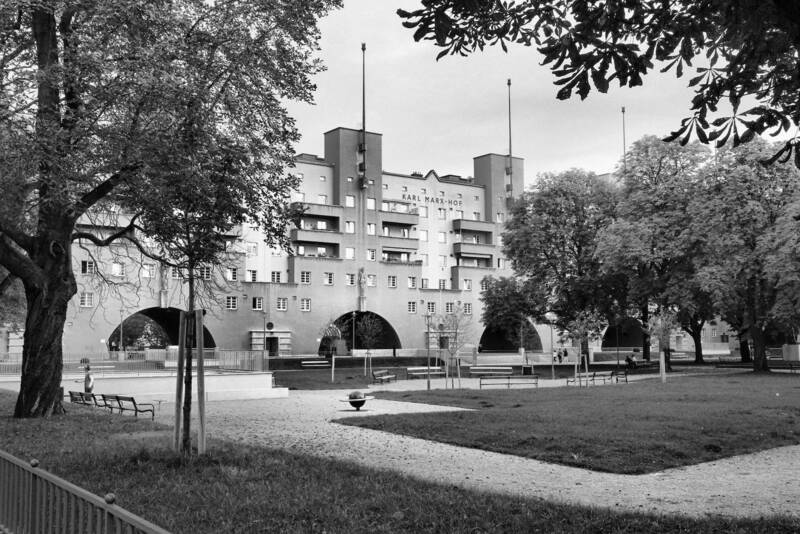 Between 1923 and 1934, the city built over 60,000 new apartments, including the Karl Marx Hof, a 1,400-unit project that gave residents access to an array of services, schools, and green space. The city provided universal health care, efficient public transport, and a wide range of social services, while building an array of communal spaces including parks, swimming pools, and libraries. Investments in public education, pedagogical reforms, and subsidies for a large network of workers’ cultural associations simultaneously aimed to enrich workers’ lives, prepare them for the socialist future, and expand the SDAP’s local political support in the face of an increasingly hostile national government. These goals were also embodied in the SDAP’s paramilitary defense force, the Republican Schutzbund and the Workers’ League for Sport and Body Culture. While the former organization aimed to protect the republic from monarchist and fascist militias that posed a growing threat, the latter sought to encourage physical fitness and to inculcate socialist values by supporting a variety of sports including everything from gymnastics to judo. The League sought to combat individualism, competitiveness, and commercialism, and promoted collective activities and comradely competition. Over time the activities of the League became increasingly connected with those of the Schutzbund, and sports training as well as public spectacles became increasingly militarized. With 300,000 members at its peak, the League became the largest workers’ athletic organization in the world and, together with the Schutzbund, symbolized the labor movement’s power. The Austro-Marxists reveled in their movement’s apparent organizational power and in the political and social reforms they had won. Socialists elsewhere looked with admiration at the workers’ city they’d built, and tried to carry out comparable reforms where they could. By the middle of the 1920s, the Austro-Marxists’ regarded these gains as a secure foundation for future advance. They also believed history was on their side. With the emergence of monopoly capitalism, they thought the economic system would be less prone to crisis and thus easier to take under democratic socialist control in the future. So the economic collapse of 1929 and the fascism’s emergence as a mass movement came as a shock. They were theoretically, practically, and psychologically unprepared to deal with either. Like most Marxist theorists of their day, the Austro-Marxists had no effective responses to the economic depression short of “revolution.” They proposed rather orthodox policies such as budget balancing and austerity to right the capitalist ship. When that failed, they fell back on the hope that the depression would soon bottom out and that the economic recovery would take the political wind out of the fascists’ sails. In practical political terms, the Austro-Marxist insistence on adhering to constitutional and parliamentary norms left them helpless in the face of enemies, like the Nazis in Germany and the clerical fascists in Austria, who “adhered” to parliamentary methods while simultaneously pursuing terror on the streets. When the moment suited them, they were prepared to openly throw the rules of the liberal republic overboard, while the socialists — facing mass bloodshed and the outbreak of a civil war they feared could not be won — hesitated to the point of paralysis. When the fascists acted, first in Germany in 1933, and then in Austria a year later, they were able to annihilate the organized left, socialist and communist, with shocking ease. Even where the socialists resorted to arms, as in Austria, it took just a few days for the state to crush the resistance. The most prominent Austro-Marxists paid a heavy price for their failure. While Renner survived the Third Reich to become the Second Austrian Republic’s first president, Hilferding and Bauer fled into exile, where they vainly attempted to carry on the fight. Bauer died in Paris in 1938. The Vichy French authorities arrested Hilferding in Arle in early February of 1941 and handed him over to the Nazis. He committed suicide in a Gestapo dungeon in Paris shortly afterward. The Austro-Marxists’ tragic demise dramatizes the difficulties of linking socialist transformation to day-to-day practice, between yoking reform to revolution. Like all Social Democrats of the period, the Austro-Marxists failed to connect their radical conclusions to their immediate demands. There was no discussion of the strategies and tactics that would set the party on the road to power, or what methods could be used to defend democratic advances against antidemocratic forces. There was only the assumption that the ruling classes would pay a heavy price for not respecting workers’ rights, that the party would take power and transform society without the use of mass action. Reform-minded socialists today can’t make the same mistake. William Smaldone is E. J. Whipple professor of history at Willamette University. He is the co-editor of a two-volume collection on Austro-Marxism and the author of Rudolf Hilferding: The Tragedy of a German Social Democrat .